Baha’i Faith assert that a person may accept the Baha’i Faith and continue to be a faithful Christian. However, is the aforementioned statement the truth of the matter? The Baha’i belief is truly refined and several of its adherents today are knowledgeable, fervent, diverse, politically liberal, but still socially traditional. Likewise, Baha’i believers are not only conventional when it comes to understanding their own Baha’i scriptures. More than that, studying the scriptures of other world religions are expected. It is actually probable to see a Baha’i believer who is more knowledgeable on topics about Christianity than the common Christian. They prioritize education such as gender equality, unlimited education, and consensus among religion and science. However, the Baha’i religion still has countless theological loopholes and doctrinal disparity for that matter. In comparison to Christianity, its root teachings are exclusively typically superficial. The distinctions are broad and essential and we need a longer article just to study those things thoroughly. Baha’i is one of the recently established religions originating out of Islam in the land of Persia yet it attained an extraordinary prominence. It has also esteemed itself as an uncommon world religion considering its size of 5 million adherents; its global range (236 countries); its autonomy from their religion of origin which is Islam; and for its unique teachings and inclusive belief in one God. Christianity is a faith-based religion composed of people who believe that God saves every person because of His mercy upon them; and because of that, His will is not foiled by the wickedness or failure of humans. Christians also believe in the assertion that every person is enslaved to sin because of the fallen nature of man. Humans are naturally unwilling to love God. They tend to be selfish creatures who deny the Holy Law of God. Christianity also has a teaching asserting that God has predestined everything before the foundations of the world. The predestined ones are given to Jesus Christ for salvation. Humans who are not chosen gain the blameless judgment of God because of their sin. To add to that, Christianity also teaches and believes that Jesus’s atoning sacrifice was the surety and assurance of the Christians for their salvation. This signifies that the sins of the chosen people were the only atoned for by Jesus’s sacrificial death. The Christian religion believes that the redeeming grace of God is only applied to those elected by God to be saved. The powerful sovereignty of God through the Holy Spirit cannot be opposed and Christians willingly abide to Christ. Lastly, all true Christians definitely trust in the sovereignty of God. Christians believe that the will of God cannot be opposed by humans or anything in this world. The humans chosen by God for redemption will persevere in faith until death. It only goes to show that those people who supposedly cease to have faith in Christ either at no time had genuine faith at the outset as mentioned in 1 John 2:19. The Bahá’í Faith was established in Persia in the 19th-century by Bahá’u’lláh. Because of that, Bahá’u’lláh was exiled for teaching the Baha’i faith and eventually died as a prisoner. When Bahá’u’lláh passed away, his son Abdu’l-Bahá became the leader of the new religion and it continued to spread from Persia and the Ottoman Empire to America and Europe, and even suffered great persecution in Iran. After the death of the son, Abdu’l-Bahá, the Bahá’í religious community entered a new leadership phase. It evolved from a sole leadership to an order of administration with elected groups and appointed people. 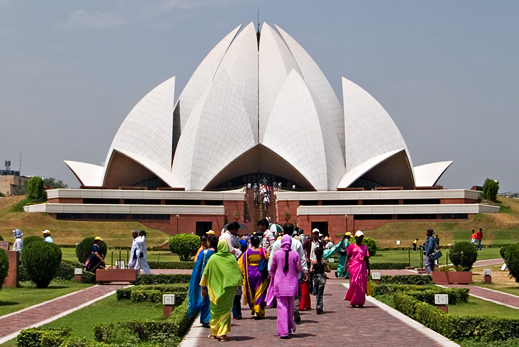 Probably, there are greater than 5 million Bahá’í believers worldwide living in more than 200 countries. Christianity is wrongly portrayed as a religion that originated from a small group of followers of Jesus in the first century. The truth is according to Scriptures, Christians are predestined to exist before the foundations of the world. Baha’i believers claim that the nature of human is basically spiritual and good. A quote that is taken from their web site is saying human nature is basically good. Baha’u’llah declared that our true identities reside in our eternal souls. Baha’i teachings says that the sole purpose of every human soul is to have knowledge about God and to love Him. The Bahai believers do not abide in original sin in the original sin doctrine instead, they teaching and believe that each person can have the choice to use his or her the divine attributes in his or her life. The teaching of the Holy Bible is contradictory to the teachings of the Baha’i religion that humans are basically imperfect by possessing a natural tendency to be wicked and self-serving. Christianity teaches that without Christ, all of the elects are spiritually dead in our disobedience and transgressions. In reality, the Scriptures teaches that the heart of men which is the inward being is truly wicked. Christianity also has a teaching called “original sin”, which the Baha’i clearly rejects. Original sin happened because of the first sin of the first created one, Adam. All humans transgressed, and this sinful nature of men has been handed down through generations. The Christian Bible teaches that no human being is righteous, and that we all fall short of God’s glory. The Baha’i religion tries to place Jesus Christ alongside Moses, Abraham, Krishna, Zoroaster, Buddha, and many more. As they say, those who established the Baha’i religion are said to be the most recent instance of the “progressive revelation” of a Holy God. But the truth is, Jesus is positioned highly than other so-called holy prophets or individuals. Only Christ was put to death through crucifixion for the sin of the elect of God as stated in John 6:44. Jesus is the only one who has risen from the dead. All of those so-called holy men are still buried in the ground; while Jesus is the only one who conquered death and performed miracles that God alone in human body could do. The Baha’i doctrines center around oneness and Baha’i believers adhere to a belief that unity of all religions is essential. Baha’u’llah stressed the value of being united, and harmonious in every human action. The consecutive messengers and prophets established their religions at various era in history and Baha’is believe that each religion form a role of one systematic, united and progressive revelation from God. On the other hand, Christ taught that the only way to God is though faith in Jesus. In fact, Jesus proclaimed that He is the Door of the sheepfold. He proclaimed in His Holy Word that He is the way, the truth and the life and no one comes to the Father except through Him. Bahai believers adhere to a belief in one God who teaches humankind through different religions even in different times. The writings of the Baha’i state that the Maker is an unknowable entity which is really hard to comprehend. According to them, God has provided humanity with divinely-inspired prophets and messengers throughout history who founded the world’s great Faiths and brought ethical, moral and spiritual teachings to aid and enlighten all human beings. The Bible teaches, and Jesus affirmed, that there is One God. The Bible also says nothing about His revelations of Himself through successive religions. In fact, much of the New Testament warns believers about false Christs, and every thing that would lead Christians astray. Contrary to what Baha’i teaches, the Bible tells us that God is a personal God and is far from being an unknown entity. The Bible also tells believers to “hold fast” to the truth that was delivered to them. God, through the Holy Spirit, directs the chosen ones into a knowledge of the Holy Scriptures; and He does that through the Scriptures alone and not on extra writings concerning other religion. The Bible is the unified and absolute revelation from the Holy God to the elect, from Genesis to Revelation. A solid admonition not to add, or subtract from the Scriptures is given in the Old and New Testaments. Truly, there are a few pleasing things in the Baha’i faith such as their promotion of love, peace, and even some facets of Christianity. However, there are prominent differences to the Christian faith and Bahai religion. 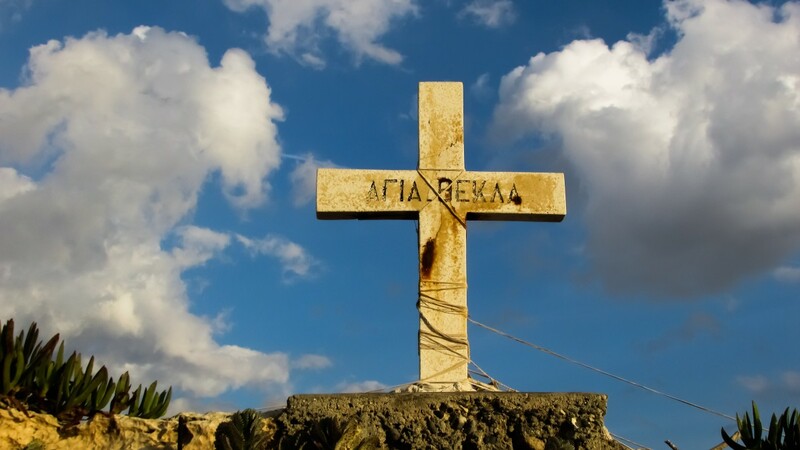 The truth is, one is not a Christian if he or she still abides by the Baha’i religion. If one believes the teachings of Baha’i, then clearly he or she refuses the numerous teachings of the Holy Bible, and of the Lord Jesus Christ. Julian Angelo. 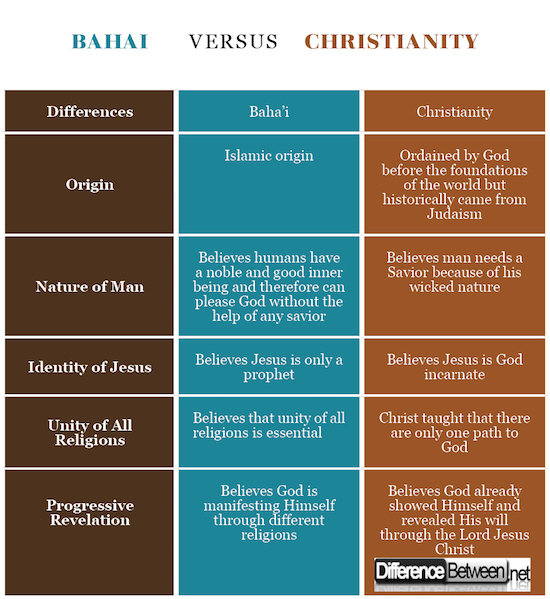 "Difference Between Bahai and Christianity." DifferenceBetween.net. April 5, 2018 < http://www.differencebetween.net/miscellaneous/religion-miscellaneous/difference-between-bahai-and-christianity/ >. I am not trying to be unkind and I thank you for allowing us to leave a comment. I am not sure ware the author got the information about what Christians believe based on salvation. and that some people were predestined to be saved and some not. John Calvin taught that, in 1536. I can assure you the Bible no ware teaches that. If you read it again what is predestined is the plain on how salvation would come into the world through his crucifixion. Not the people that would be saved it is not Gods will that any should parish but that all would come to repentance. I would be more then Happy to speak with any one in your religion about this. Matter of fact we could discuss anything feel free to email me with any question you have. all I would ask is you pick the subject and that would be the topic of conversation.